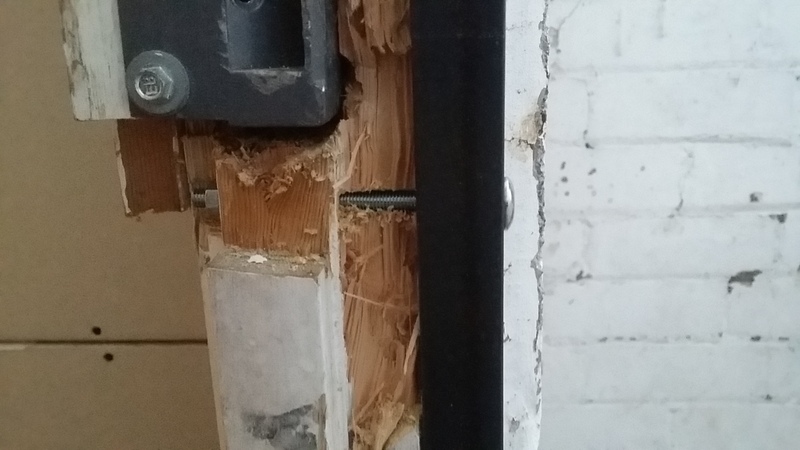 Hardening A Door Frame Against Attack – How Nigel Solved A Problem! A few months ago I was called to a break-in. Fairly unusual, as it was a commercial premises in a town centre, and the attacker(s) had clearly taken their time getting in. The outward opening steel-faced wooden door was in reasonable condition, aside from about a dozen holes drilled around the rim lock, but the frame was missing about a foot of material where the attackers had gone through the frame to attack the nightlatch. I’m not quite sure whether they had done the drilling first or second, and the floor had been swept, but the whole thing was a mess. So, how to both repair it and make it stronger? I decided that a 6 foot length of 25x25x3mm angle iron was the way forward, fitted full length down the frame. This would cover the damage and be far stronger, and, the waby I fitted it, also far faster than messing about splicing in new timber, planing to size and making good. The best way, if you can, is to recess the angle iron into the door frame, then bolt and screw it into position. 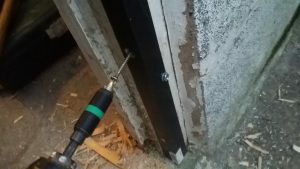 Now, if you don’t have a vibrating multi-tool, you are likely thinking I must be mad, but if you do have something like the Fein MultiMaster or Bosch MultiX then you are likely smiling slightly, wondering why you’d not thought of this. I only had the little cordless Bosch vibrating saw and two batteries with me, but decided that if the worst came to the worst I could fall back to a chisel and mallet, and I decided to do this bit first, as it needed doing. Firstly, I cleared the screws and old bits of metal out the frame, from top to bottom. 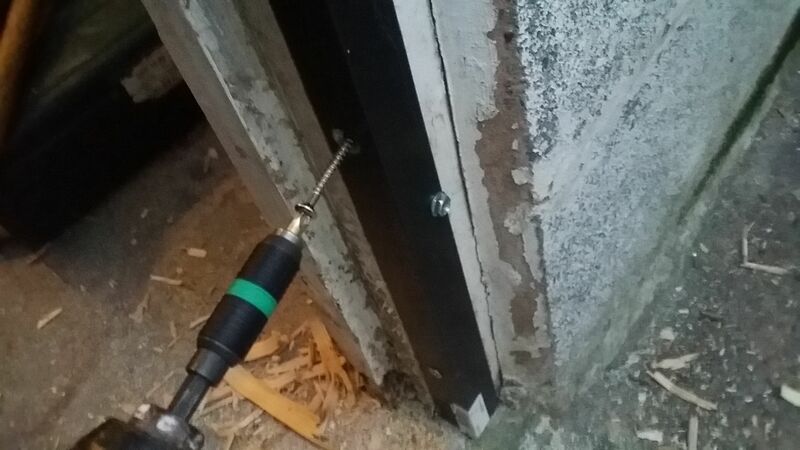 Sawing through a rackbolt keep is possible, but why waste effort and battery? I could see the sashlock keep would be tricky, but I opted to cut the angle iron with the disc cutter rather than destroy the BS rating on the new lock I was fitting. The second step was to cut the angle iron to length. 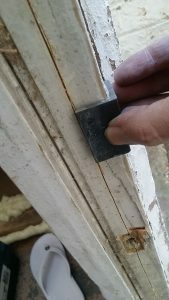 This left me with a 45mm long section of angle iron for a template, and a single long bit running top to bottom of the door. Next, cut away the angle iron to fit around the sashlock keep. 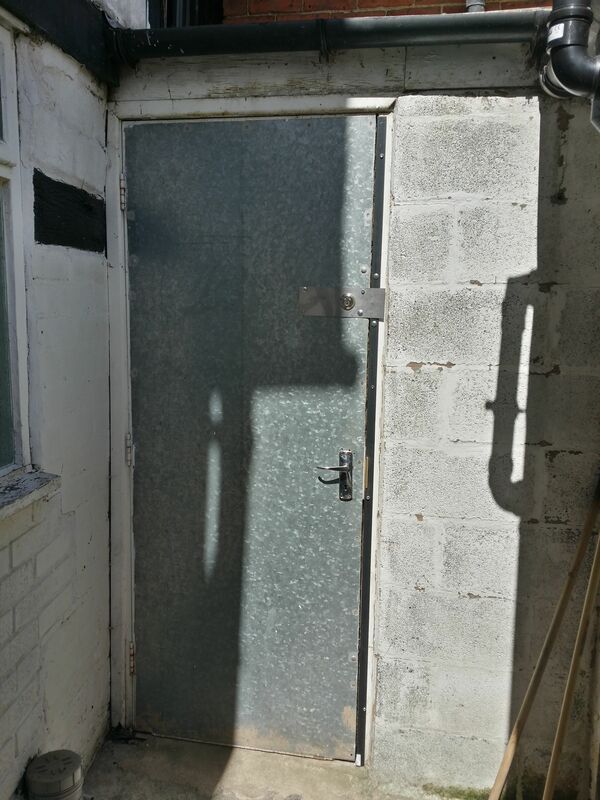 This took a few tries to get it perfect, and I stopped to upgrade the sashlock (which, of course, had not been locked when the break-in occurred!) 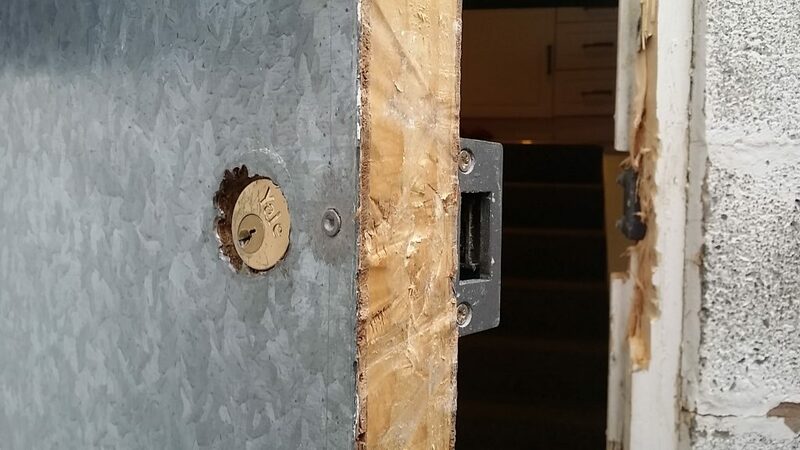 to a new British Standard 5 lever and I sank the box in with the angle iron behind it. Now for the “hard part”. I took the multi-cutter and fitted a wood cutting blade, then, holding the offcut angle iron, I simply slid both bits from top to bottom of the frame, thus ensuring a perfect straight cut. Make sure you go into the wood at least as deep as the thickness of the angle iron, and once the edge is done, repeat for the face cut. With a mains powered cutter or more batteries, I’d have then completed cutting the wood away, but instead I only did the damaged area, then simply chiselled the rest away. You don’t need to be too precise after the initial cuts, since you are about to glue and screw nearly 6 feet of angle iron over your work. Once cleared, simply check the fit, and, once happy, glue it in place. I drilled a couple of holes so I could add two screws top and bottom for clamping while it dried, for ease, and once happy I added a half dozen more self-drilling self-tappers to the outside face, and countersunk half a dozen more screws into the other edge. 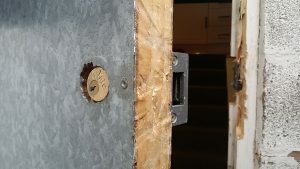 The sashlock keep was all fine, so that was replaced, and then to make sure it was secure, I added a couple of through bolts to support the rimlock strike with lots of steel. This made up for the lack of wood caused by the attack and was, of course, made far stronger than mere softwood door frame could ever be. Faster than replacing the wood, and more secure, which is a win for everyone. Except the burglars, who, should they ever come back for some more easy takings, will find the going far harder. As it should be.